A weight distribution system allows you to distribute the tongue weight of the trailer to both axels of the towing vehicle. This allows you to tow larger trailers, while providing you with a more level ride. This reduces the stress on the rear of the tow vehicle and provides greater steering and brake control. 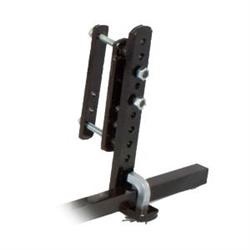 8" Bracket Kit, Allows You To Use Your Equalizer Unit on 8" Trailer Frames. Extra Bracket Kit, Allows You To Use The Equalizer Unit on Another Trailer. Integrated Sway Control means the hitch design incorporates friction points that provide sway control, without the hassle of an add-on sway bar. Once the spring arms are engaged, so is the sway control.